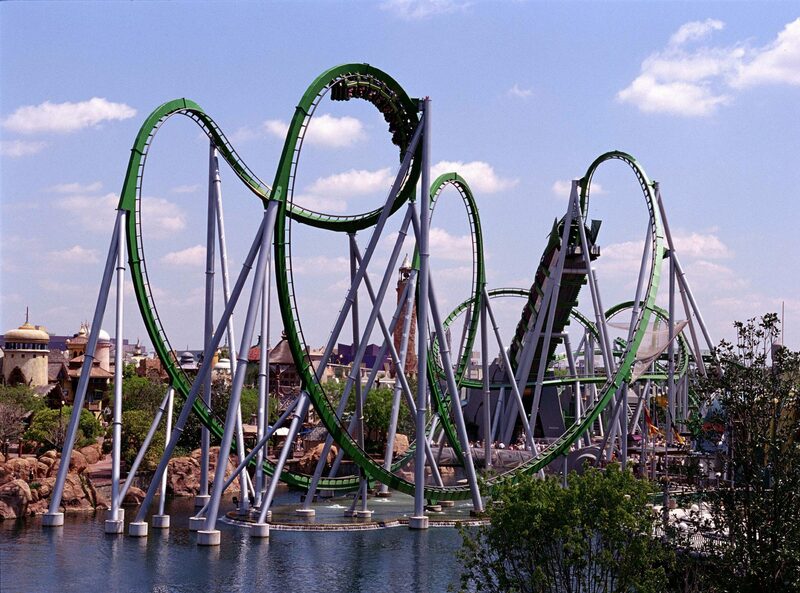 The Incredible Hulk is a sitting roller coaster situated in Universal Orlando’s Islands of Adventure. The ride was manufactured by Bolliger & Mabillard and opened on May 28, 1999. Riders board the train and are sent into the gamma-ray accelerator. The train then is propelled from the gamma-ray accelerator at a speed of 40 MPH. The launch takes less than two seconds, and sends riders into a zero-g roll, down a 105-foot drop, and then into a cobra roll. The train then completes a vertical loop and enters a tunnel of mist. From there, the train completes a corkscrew into the back area of the ride and enters another loop. The train then enters a brake run surrounded by two over-banked turns, goes down another hill, enters a corkscrewm and turns around to the camera zone. Finally there is one last helix and the train enters its final brake run before riders depart at the unload. On August 14, 2015 Universal Orlando announced that The Incredible Hulk would be closed and refurbished on September 8, 2015 and open again in Summer 2016 . The ride vehicles are updated, and overall changes to make the ride experience more modern and high-tech. In April 2016 the final piece of the track replacement was completed. Universal Orlando has announced that The Incredible Hulk will be closed for an extensive refurbishment. The ride will go down on September 8, 2015 and roar back to life next summer. Included in the refurbishment is enhancements to storyline, ride vehicles and overall experience. The updates to the ride have been described as making the ride feel more immersive and high-tech.